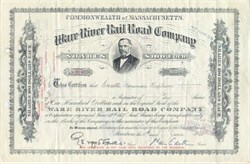 Beautiful Certificate from the famous Ware River Railroadissued in the 1940's. This historic document has an ornate border around it with a vignette of a man's portrait. This item is hand signed by the company's president and is over 56 years old. Organized June 12, 1873, under the statute of April 21, 1873, as the successor to a corporation of the same name, incorporated March 16, 1867, and sold under foreclosure proceedings on May 22, 1873, and road extending from Palmer to Winchendon opened in November, 1873; leased January 1, 1874, to the Boston and Albany Railroad Company for nine hundred and ninety-nine years, at an annual rental of seven per cent on its capital stock, which is at present $750,000. Its authorized capital is $1,000,000. The lease was assumed by The New York Central and Hudson River Railroad Company.